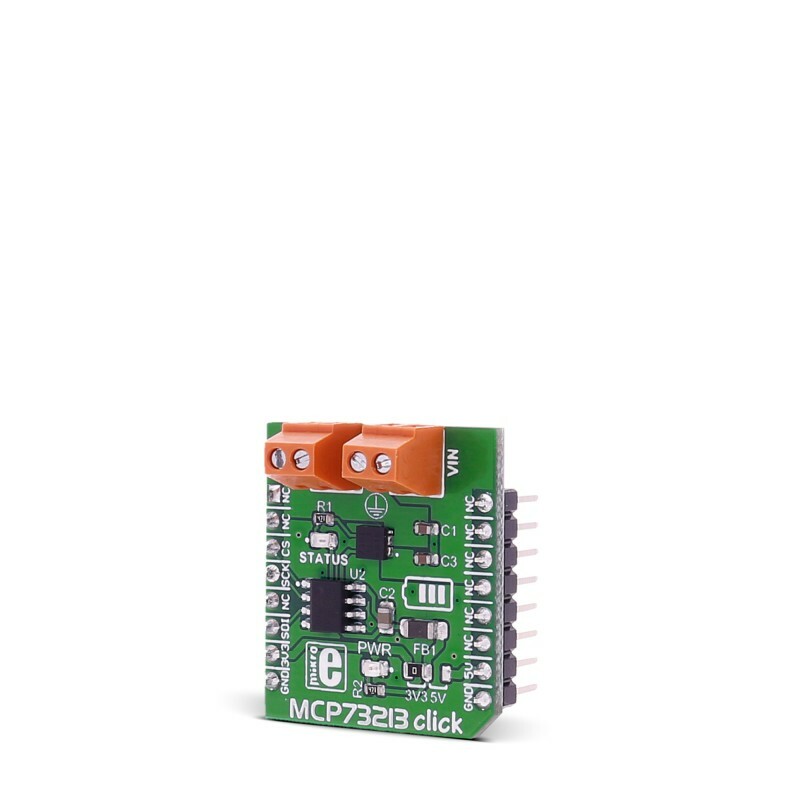 MCP73213 click carries the MCP73213 dual-cell Li-Ion/Li-Polymer battery charge management controller with input overvoltage protection from Microchip. The click is designed to run on either 3.3V or 5V power supply. It communicates with the target microcontroller over SPI. Note: The click is designed to charge a dual-cell Li-Ion/Li-Polymer battery. The input voltage needs to be higher that the voltage of a dual-cell Li-Ion/Li-Polymer battery. 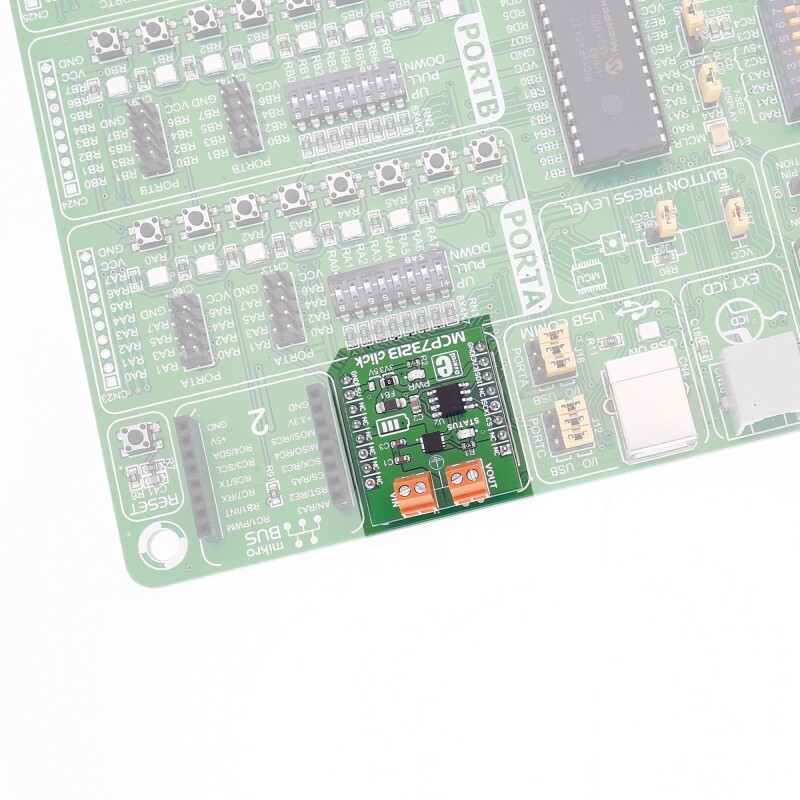 The MCP73213 is a highly integrated Li-Ion battery charge management controller. The MCP73213 provides specific charge algorithms for dual-cell Li-Ion/Li-Polymer batteries to achieve optimal capacity and safety in the shortest charging time possible. 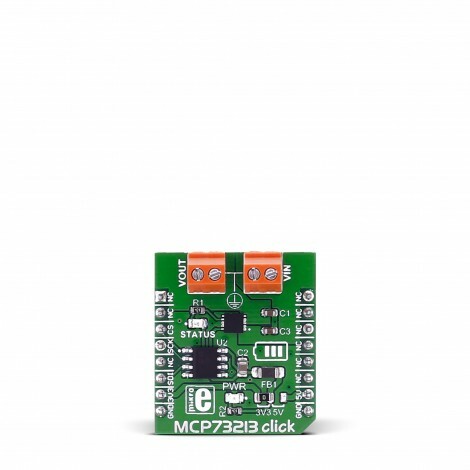 The absolute maximum voltage, up to 18V, allows the use of MCP73213 in harsh environments, such as low-cost wall wart or voltage spikes from plug/unplug. 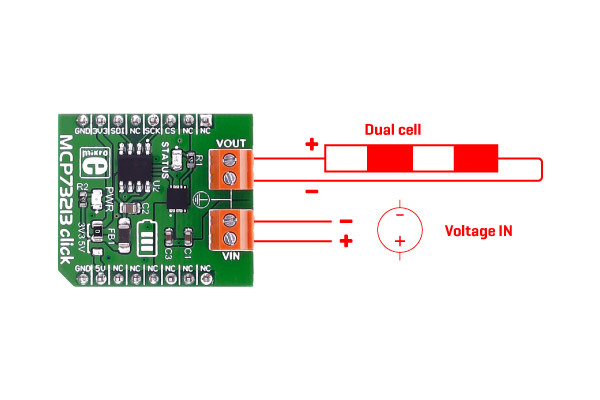 An internal overvoltage protection (OVP) circuit monitors the input voltage and keeps the charger in shutdown mode when the input supply rises above the typical 13V OVP threshold. The OVP hysteresis is approximately 150 mV for the MCP73213 device. First you need to connect the input voltage to the input screw terminal. Then to set the input voltage, because it needs to be larger than voltage of two series connected batteries for regular charging, (which means it needs to be >8V). We can change the charging current trough SPI interface. Now just leave the batteries to charge, and when they are charged it will be signalized on the status LED. Applications Portable Media players, digital camcorders, handheld devices, etc. 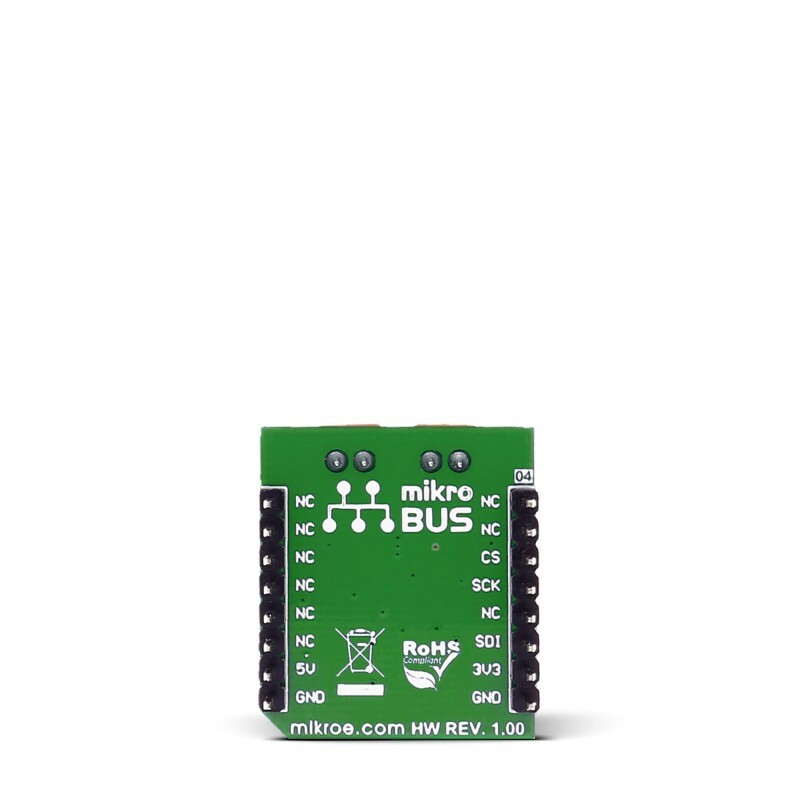 This table shows how the pinout on MCP73213 click corresponds to the pinout on the mikroBUS™ socket (the latter shown in the two middle columns). Code examples for MCP73213 click, written for MikroElektronika hardware and compilers are available on Libstock. The following code snippet shows how to initialize the SPI interface, and then use it to set output current to 250mA.